I was filled with trepidation as I travelled to the workshop where I would have an opportunity to meet other women who had had Postpartum Psychosis. What would they be like? Were their experiences the same as mine? Would I be comfortable talking openly with strangers about such a traumatic time? Would it be difficult and upsetting to speak about things I hadn’t spoken about before? The apprehension I felt was far outweighed by the excitement. Throughout my illness, I had desperately wanted to speak to someone who had recovered from PP, someone who understood what I was going through and could give me hope that I too would get better. Unfortunately I didn't have that chance and it wasn't until a year after my recovery that I finally met another sufferer face to face. To spend a weekend with seven other women who had had PP was a real privilege. I was greeted with a roomful of smiles over coffee and cakes, as we made our introductions. There was an instant rapport between us all. With each new introduction, I knew from the first look in their eyes that we just knew and understood what each other had been through. It was incredible. 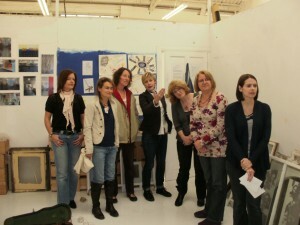 The discussions started with Joan explaining her aims and ideas and I enjoyed hearing about her previous art projects. It was great that she was taking on this daunting project and was so willing to listen – at last, we had a voice! There was certainly no problem in opening up and chatting freely with each other; we all had so much to say and there was so much we wanted to hear. We chatted enthusiastically, laughed, joked and shed a few tears. It was remarkable to hear about the similarities and differences in our illnesses and treatments. I was shocked to hear that so little had changed over many years, even decades! The time flew by and I felt that we could chat on forever. Later that evening we enjoyed a lovely meal, chatting together again as if we were old friends. It had been an emotional day, we were all feeling drained, but we felt proud that we had in some way broken a silence and spoken out about the realities of PP. Strong friendships were quickly formed and we looked forward to meeting up again later in the year. The day that the Radio 4 programme aired was another day of trepidation. Would people be shocked and judge us by what we disclosed? Would they see us as the normal, intelligent women that we are? Would it give a clear picture of the issues? As I listened to the programme I thought: “Wow, this tells it how it is!“ The women involved described the personal and emotional effects of the illness, and experts gave informative scientific information. “Unravelling Eve” proved to be a very positive experience for all those involved. For me it was an emotional yet healing, even cathartic, journey. After the broadcast I received positive and supportive feedback from family and friends, many of whom were surprised to find how little they knew about PP and the challenges I had faced. I look forward to seeing the final artwork arising from the project and to meeting the group again, and am excited that APP's future initiatives will enable more women to meet up, to share experiences and to support each other.